Not to be confused with my greenhouse garden. Speaking of my greenhouse, I’ve been having a little trouble with it. There are two issues: 1. That there is too much shade and therefore not enough sunlight and 2. I might have watered the veggies too frequently. The overwatering has resulted in yellowing bottom leaves and gnats galore. I’ve somewhat fixed the problem by being really stingy with watering. If I feel any moisture in the first two inches of soil then I leave the plants alone. Since doing this, I’ve gone up to 5 days without watering! I have to remember that the plants are in a greenhouse in pots so they don’t need much. So far so good now that I’ve changed my ways. As for the sun problem, I did a couple things. First, I cut back a couple of pine tree branches to let in a little bit more light. I also bought a GlowPanel 45 LED Grow Light that covers 5 square feet. Even though it was pricey, I figure it’s a lot cheaper and ‘greener’ than buying vegetables that I have traveled across the country to my plate! It also only uses 28 watts of power but produces 250 watts of sunny light. Super cool. I wish I could tell you that it works great but I got it out of the packaging yesterday and it wouldn’t turn on! Hopefully, once I get a new one, I’ll be posting about giant tomatoes and peppers. The last and final thing I did to try and combat the shade was to move some of the plants to a spot outside that gets more light. To the right of our side entrance we had a huge mess of weeds and plants so I thought it’d be a good location. The week before I started my solo work, my sister and I uprooted all the weeds and transplanted the plants in the foreground of the photo (that need mulch!) from the area in the back. 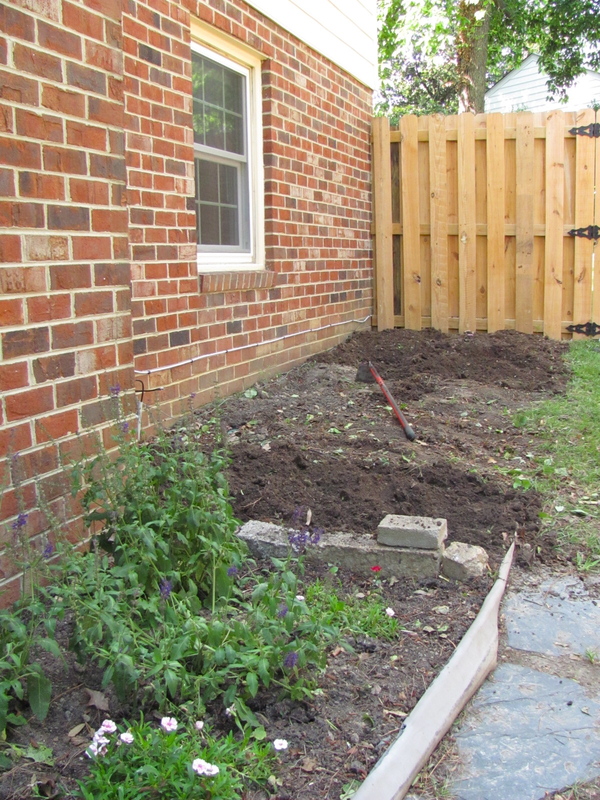 Because this was already done, I was able to start tilling the soil right away using a hoe. Can I just say that I feel quite silly using these gardening/farming terms? Especially when one reminds me of my love for Ludacris. Does that explain a lot? I hope not, ha. Please keep reading! Anyways, tilling is tiring!! I had to stop ever couple minutes to take a breather and rest my weary arms. 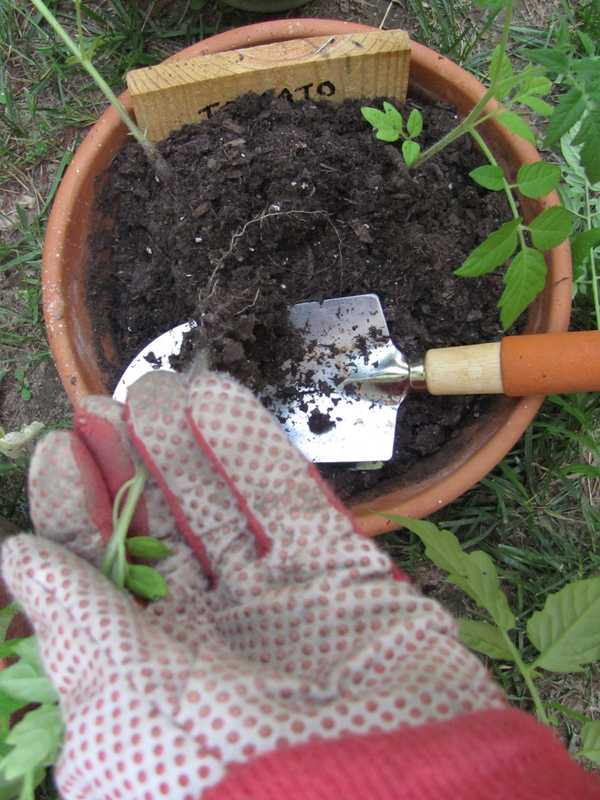 After I was fiiiinally finished, I mixed in my new top soil with the existing soil per the instructions on the bag. I then dug out little trenches to help water filter out. I don’t even know if I was supposed to do that part but it’s what I always see online. 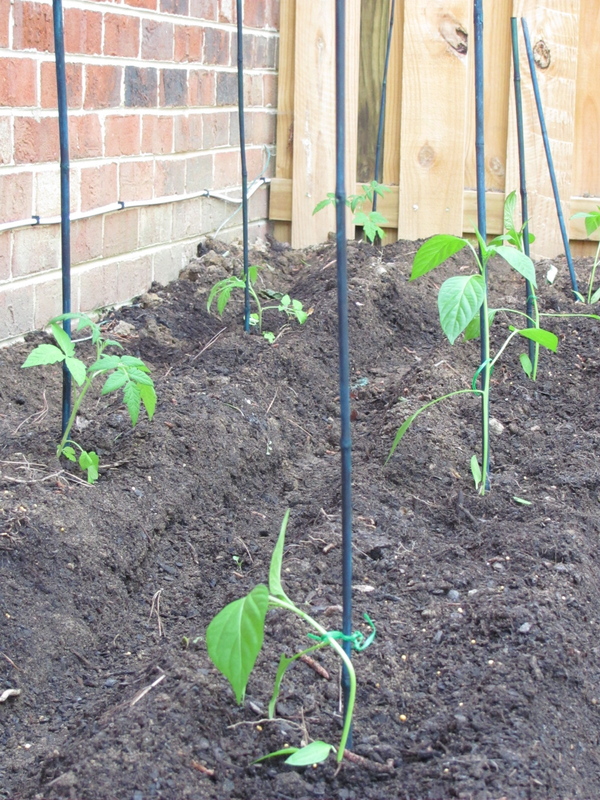 I laid out my 2 feet long bamboo sticks to space out where I wanted to plant my veggies – every 3 feet for tomatoes and squash and every 2 feet for the peppers. 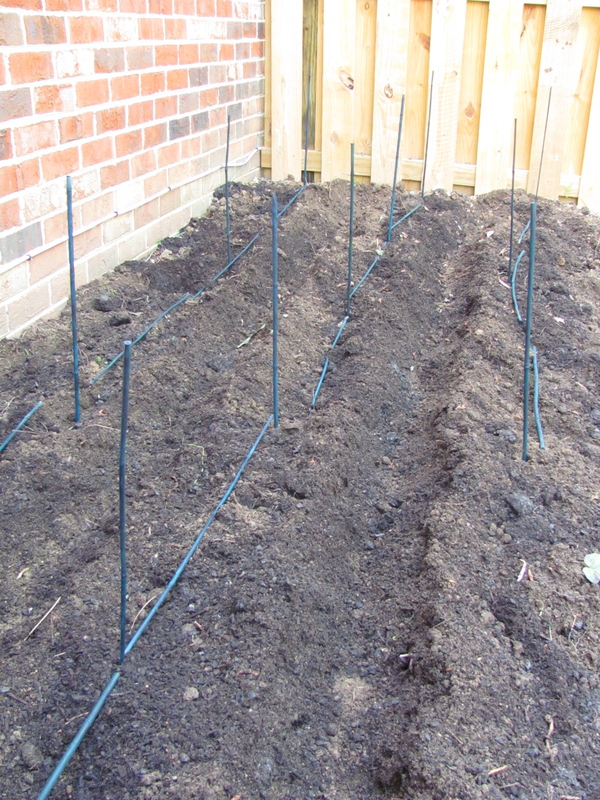 Then I carefully dug the plants out of their pots and planted them next to their poles. And tied them to the poles using twist ties. I know they aren’t very tall but I figured a little support this early wouldn’t hurt. I’m still a bit worried about the amount of sun these plants will be getting too. I know they should be getting at least 8 which they aren’t BUT I’ve got nothing to lose! I wish there was someone that could come over and just tell me what to do with everything but hey, it’s an experiment! This gardening stuff is fun and if I get a couple tomatoes at the end of the July it’ll be icing on the cake pasta sauce on the spaghetti! Are you taking any risks in your yard? Any new plants? This entry was posted in Green and tagged DIY, food, gardening, green, healthy food, healthy habits, vegetables. That’s so awesome! I wish I had a yard 😦 haha. I do have a community garden plot at work, but it would be nice to have it in my backyard!! 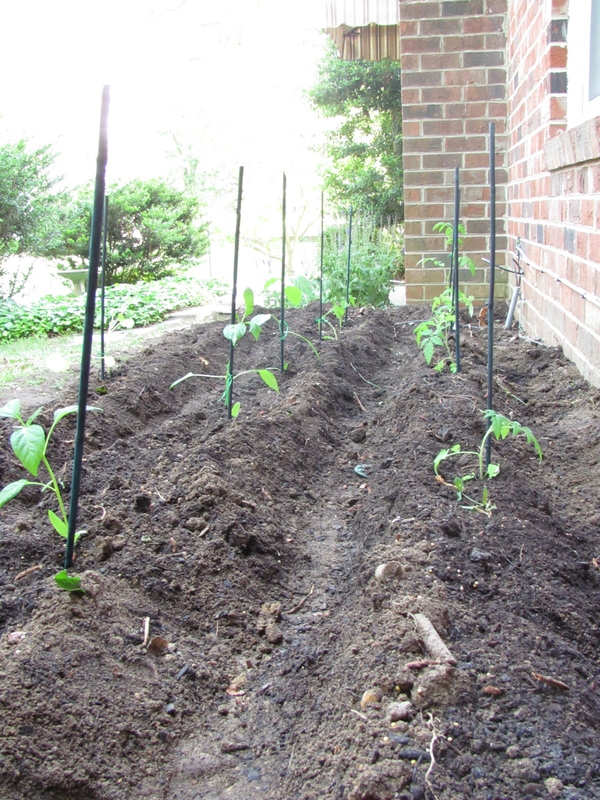 Did you plant in your plot yet? ?